For wildlife enthusiasts, nature lovers, hikers and bird watchers, binoculars are as essential as a good pair of shoes. From gazing across dramatic cliff views, to spotting a rare bird in the distance, binoculars open up a magical world that would normally be out of reach to the naked eye. 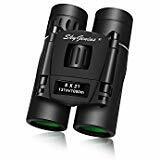 Whether you are a serious bird watcher, avid hiker, nature tracker or just want to gaze at the sunset from your balcony, there is a pair of binoculars for you. We know that finding the right one can be tricky, so to help shed some light on your choices and make deciding much simpler, we have put together this shopping guide to help you pick the best one! Roof Prisms: Because the glass elements are in line with each other, these binoculars are more streamline and easy to hold. 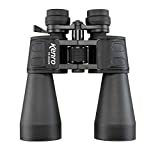 These are great binoculars for moving activities like hiking. Porro Prisms: Because their glass elements are offset from one another, they are bigger and more substantial. These binoculars offer a better depth of field and a wider field of view and offers more viewing options to viewers. 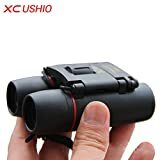 Rangefinder Binoculars: These Binoculars are battery powered and have a laser to measure distance, from binoculars to the object. They are great when on board ships, to measure the distance from you to another ship. Or to work out distances to someone in an emergency situation. They are also used by hunters to measure distances to game or by golfers who want to calculate the distance to the next hole. These are very similar to rangefinder scopes. Clarity: Happy viewers enjoy the clarity of their binoculars. Clarity is as important as magnification, and assures you lots of hours of viewing pleasure. Focus, zoom and fog proofing are all features that enhance clarity and view satisfaction. Viewing: Choose your binoculars based on what you love to look at and you will be satisfied. Bird watching enthusiasts love the viewing capabilities of their pairs, while star gazes that opt for the larger more advanced binoculars get equal enjoyment. Comfort: Comfort is very important to viewing, so make sure you choose binoculars that are comfortable to look through and handle. If you plan on doing a lot of walking, go for the lighter models that are easy to carry around your neck, leaving you more energy for exploring. Ease of use: Reviewers value how easy it is to operate their binoculars. Things like one finger zoom changes and focus rings offer convenience and easy viewing pleasure. The magnification of your new binoculars will determine the distances you will be looking and choosing depends on what you want see. These are displayed in numbers, like 10 x 42 for example. 10 x is the power of the magnification and means you will see things 10 times closer through your binoculars. The 42 in the displayed numbers, 10 x 42, is the diameter (thickness) of the lens and works in a similar way to your camera. It will also tell you how thick the binoculars are. The larger the optical lens(the larger the number). the better the viewing clarity. The more light that gets through, and the brighter and clearer the view from your binoculars will be. Your new binoculars should have at least a 7x magnification for everyday use. If you are buying binoculars for hunting or big game watching, you should choose a pair with a 10x magnification. Anything over a 10x magnification is super quality and will help you stargaze fantastically. Although they require a tripod to keep it steady, good quality pairs will include a tripod with the purchase. Zooming binoculars offer changing magnification which give you much more versatility for different viewing situations. The pupil diameter should always be larger than the pupil of your eye. This number can be worked out by dividing the first number by the second number (10 x 42 would give you a 4.2mm pupil diameter.) The human pupil is between 2-3mm, depending on the light conditions. And a good pair of binoculars should have a pupil diameter of at least 3mm. Choosing binoculars with eye-cups will help stop glare, block unnecessary light, and make sure your eyes are the right distance from the eyepiece for comfortable viewing. These can come adjustable, which means the binoculars will fit to any viewers in your family, and can be moved aside if you wear glasses. If there are differences between your eyes, binoculars with dioptric correction would be your best choice. They allow you to set and adjust one of the eyepieces independently to the other. Waterproof binoculars are sealed with o-rings to prevent moisture getting into your binoculars. Being waterproof means you can use them in wet weather or to gaze across the sea without fear of damage.This ads a lot of longevity to your sports optics. Fog-proof binoculars not only prevent your binoculars fogging up which can be very inconvenient and make you miss a special moment, but are also waterproof and therefore safe in all weather conditions. No terrain is a match for these binoculars - from mountain to sea, they're perfect for any situation. Celestron: Celestron began in 1963 when Tom Johnson unveiled the game-changing C8 and has continued through the development of exciting products with revolutionary technologies and one-of-a-kind innovations including binoculars. Nikon: This top Japanese Brand started in 1917 when three of Japan's leading optical manufacturers merged to form a comprehensive, fully integrated optical company known as Nippon Kogaku K.K. They have been a brand leader ever since and offer consumers good quality binoculars. Pentax: Originally founded in 1919 under the name Asahi Optical Joint Stock Co., Ricoh Imaging launched their first SLR camera in the 1950s under the Pentax name. Today they are well known for their quality binoculars as well as DSLR cameras, lenses and sport optics equipment and RICOH's.